Write Russian word in English letters is important when filling out forms or composing messages, especially when there is Russian keyboard. The English alphabet contains only 22 letters, Russian has 33. So there are some nuances in transliteration from Russian into English. Compose a word in English, following a common transliteration. Russian letter A corresponds to English A/A, B – B/B, B – V/V, G – G/g, D – D/D, E – E/e, E – Yo/yo, Zh – Zh/zh, Z – Z/z, – I/i, Th – Y/y, K/K, L – L/L, M – M/M, N – N/N, O/o, P – P/p, R – R/r – S/S, T – T/t U – U/u, f – F/f, X – H/h, TS – Ts/ts, WH – Ch/ch, sh – Sh/sh, Shch – Shch/shch, b ”, S – y, S – ’, e – E/e, Yu – Yu/yu, I – Ya/ya. Now you can write Russian word in English letters. Write SMS to phone English letters. This method will reduce the cost of the message 2 times, because it includes much more characters than when typing Russian letters. When writing SMS using the most approximate to Russian letters signs. For example, the letter "Z" is replaced by the number "3" (three), the letter "H" - "4", Russian"," English "Y", "X", "X" (x) "C" "LL", "W" and "U" - "W" "Th" - "i". The other letters are the same as in the previous method. Take advantage of special online programs in which there is an automatic transliteration from Russian into English. To write Russian word in English letters, sign in to be transliter. Type the word on the keyboard in a special box, and then click "translit" or "to perform the transliteration", then the program will alter the spelling of the word. Also there are programs that you can download to your computer. Note some exceptions. For example, the letter "y" standing after a vowel, can be written as "i" (voytik – Voitik). When writing telegrams solid ("b") and soft ("b") signs not transliterated. Russian words in English letters can be written differently in passport, driving license and other documents, compiled by the transliteration system adopted in Russia or in English-speaking countries. This is because at the moment there is no single standard for converting words. 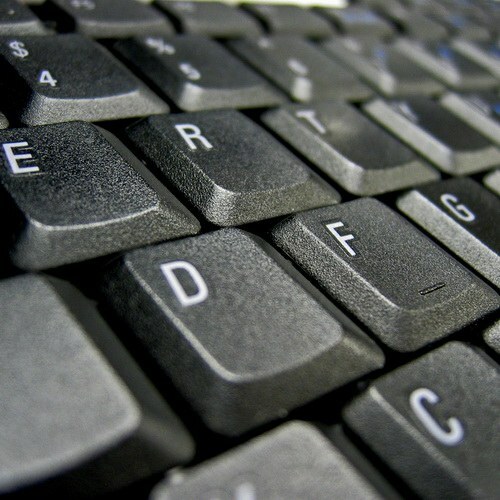 The need to write Russian words by English alphabet letters on the Internet is rarely for the reason that the network has a large number of services that provide the ability to use Cyrillic letters, even if you don't have the Russian keyboard layout. But it is still possible to imagine specific cases where you need to write "transliteration" - the so-called text, in which Russian letters replaced with their English equivalents. Use any Internet automatic translation of the text you enter in the transliteration. This is the easiest way to write Russian words in English letters. For example, if you use the service http://translit.ruafter go to the main page can immediately start typing the desired text. At the end of the input text, word or phrase, just click the button that says "translit", all typed in Russian letters was transformed into the same, but the letters of the English alphabet. If you are not able to recruit a Russian text on the keyboard, you can click the desired letter placed on this web page above the input field. Here you can choose the direction of transliteration, and not only of these two alphabets (Russian and English). There is a version of the interface specifically designed for mobile devices running operating systems Symbian and Windows Mobile. Use the table of conformity of Russian alphabet to English letters and combinations as a reference, if you want to write the words transliterated without further translation. These several tables, and you can also find on the web. For example, use the official wording of the relevant GOST called "transliteration Rules kirillovskoe letter Latin alphabet". Though not always and not everyone uses a match table specified in the Guest when it is important the ease of use and not in compliance. Can use other tables, for example published on the website Lingvotek. Use memory-resident programs with the functions of transliteration, if you want to translate the text in translation without Internet connection. For example, the program Punto Switcher, primarily intended for automatic switching between Russian and English keyboard layouts, has the option. It can help translate the words of the Russian text in transliteration it is enough to select the desired fragment in the editor and press ALT + Scroll Lock. 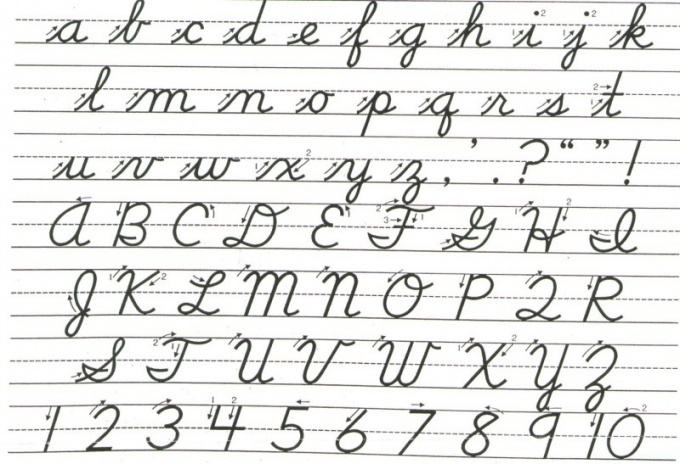 Learn to write uppercase letters of the English alphabet is harder than just learning it. Uppercase letters are easier to write than printing, as they have smooth transitions, to create them possible without taking the hand. To learn to write beautifully, do not have to copy the letters. Their appearance is quite individual. Most importantly write clearly so that readers understand your written text. If someone believes that in our age, to waste your time to learn how to write in cursive, it is not necessary, it is possible to write in block letters. As the printed letters are not connected to each other, it is necessary to observe the minimum distance between them to the spaces inside the words were not more than gaps between words. 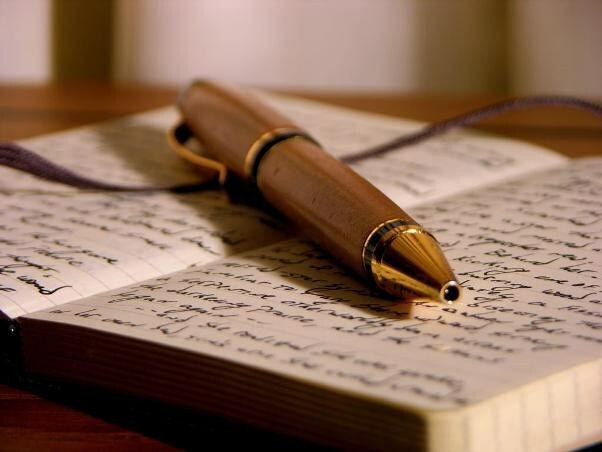 But know that writing letters by a printing method, you can significantly increase the time for writing a text. Besides, if you will only write printed letters, you will not be able to read handwritten texts. If you want to write English quickly, nice and clear, start writing in cursive capital letters. This is in elementary school can take a special training notebook, with words. First just try to connect the letters, try to write without moving your hands, this increases the speed of writing. No requirement for uppercase letters no, but choose a way of writing that everyone understood it. Also writing uppercase letters developing fine motor skills in children, which is useful for the overall development. Learning to write uppercase letters you will not go unnoticed, because a beautiful handwriting and neatness are highly valued. To learn to write beautiful and elegant, you need to exercise regularly. But beautiful handwriting is only part of the skill. The most important thing is to learn how to write correctly, and this will need to learn all the rules of the language. And choosing the font which you will be the most interesting and easy to write, consider the fact that you understand.